Maria Carlone first appears in the Painesville, Ohio, area about 1905. 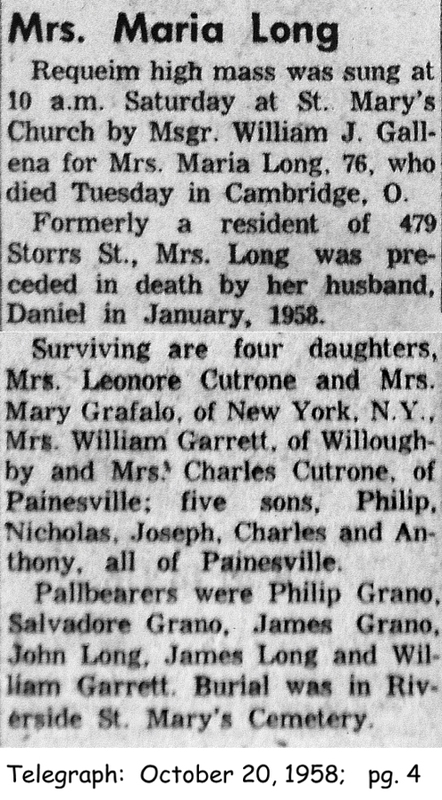 In America, Maria Carlone was known by her married name, Maria Long. Maria Carlone was born on June 14, 1882, at Elena (now Gaeta), Italy. She married Donato Longano about 1902 at Italy. Maria died on October 14, 1958, at Cambridge, Ohio, at age 76. Her body was interred at Riverside Cemetery at Painesville, Lake County, Ohio. Maria Carlone immigrated to the United States in 1905. She immigrated with her infant daughter, Lena Longano. Their destination was probably Painesville, Ohio. She resided at 479 Storrs Street, Painesville, Lake County, Ohio, until her husband died in January, 1958.